What lies ahead for cars? The need to improve air quality and the quest for more fluid means of mobility, and sometimes dogmatic viewpoints have led some to want to exclude cars from towns. Despite the undeniable progress that has been made to mitigate its impact, cars remain a source of undesirable externalities. In France, transport represented 26.9% of greenhouse gas emissions in 2013 and 28% of particulate emissions in the Île-de-France region. Congestion in city centres leads to increase in both of these emissions and a considerable loss of time (estimated at 38 minutes per day in Paris) and money for those who drive. Read more about What role for cars in tomorrow’s world? Cities matter to the UK’s future. They are already concentrations of population and employment, and will be home to much of the country’s future population and economic growth. Cities are centres of commercial, cultural, institutional, and socia life. In short, they are both central to the shaping and delivery of national policy objectives, and the locations where broad social, environmental and economic changes play out in practice. UK cities are highly diverse, each with a distinctive history and its own set of relationships with its neighbours and with central government. This Foresight project has developed a broad evidence base and consulted local actors to understand challenges and opportunities from those most experienced in the issues affecting UK cities. The single theme which runs throughout this work is providing the best possible evidence for national and city level decision-makers. The report highlights the emerging technologies and business models that are changing the way urban services are delivered and proposes a 10-step action plan to enable cities to navigate the journey of urban transformation. Cities are growing at a rapid rate, with the global urban population set to increase by 2.5 billion by 2050. People continue to migrate to cities for better economic, social and creative opportunities. Growing cities are dense in terms of land use and, at the same time, are difficult to govern because of their diverse social and economic fabric. business models and technologies to deliver services. The use of technology and changing ownership models have disrupted the way excess capacities within cities are efficiently utilized. However, technology is not a silver-bullet solution to urban problems. To holistically address such problems cities need to transform planning, governance and regulatory aspects. We live in a world which is becoming increasingly urban, where more and more people are moving to cities. Over 54 per cent of people across the globe were living in urban areas in 2014 (UN DESA, 2014).1 The current urban population of 3.9 billion is expected to grow in the next few decades to some 6.4 billion by 2050 (ibid.). It is estimated that three million people around the world are moving to cities every week (UN-Habitat, 2009). Migration is driving much of the increase in urbanization, making cities much more diverse places in which to live. Nearly one in five of the world foreign-born population resides in established global gateway cities (Çağlar, 2014). In many of these cities such as Sydney, London and New York, migrants represent over a third of the population and, in some cities such as Brussels and Dubai, migrants account for more than half of the population. The World Economic Forum’s Future of Urban Development & Services (FUDS) Initiative serves as a partner in transformation for cities around the world as they address urban challenges. This report is the third in the FUDS Initiative. The first two presented the results of the initiative’s engagement with three Chinese cities: Tianjin (Tianjin Champion City Strategy), and Dalian and Zhangjiakou (Dalian and Zhangjiakou Champion City Strategy). With each of these cities, the Forum conducted a “Champion City Activity” in cooperation with the China Center for Urban Development and the World Bank. Global Strategic Trends (GST) describes a strategic context for those in the Ministry of Defence (MOD) and wider Government who are involved in developing long term plans, policies and capabilities. Without a strategic context there is a risk that planners, policymakers and capability developers may assume a future that adheres to preconceived thoughts and assumptions. 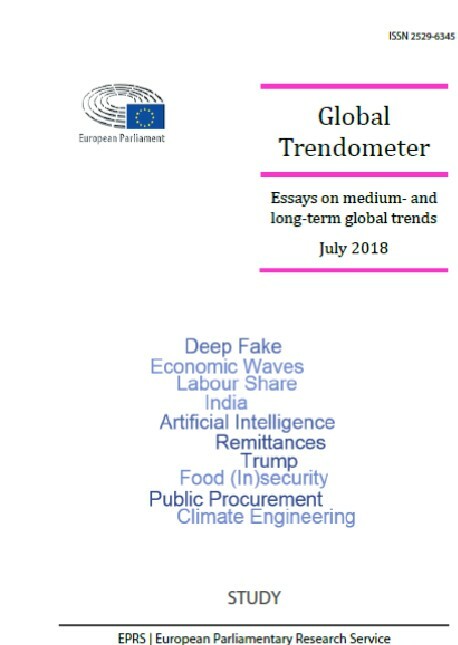 As well as providing a strategic context, this 5th edition of Global Strategic Trends (GST 5) identifies long term threats and opportunities, out to 2045. GST does not attempt to predict the future, it cannot. Rather, it describes those phenomena that could have a significant impact on the future and combines these differing perspectives to produce a multifaceted picture of possible outcomes. Recent developments in the world and the strong European commitment to a regulating globalisation argue in favour of a forward looking analysis. “The World in 2025” first underlines the major future trends: geopolitical transformations in terms of population, economic development, international trade and poverty. Secondly, it identifies the likely tensions: natural resources (food, energy, water and minerals), migrations or urbanisation. Finally, it defines possible transitional pathways: towards a new production and consumption model, towards new rural-urban dynamics, towards a new gender and intergenerational balance. 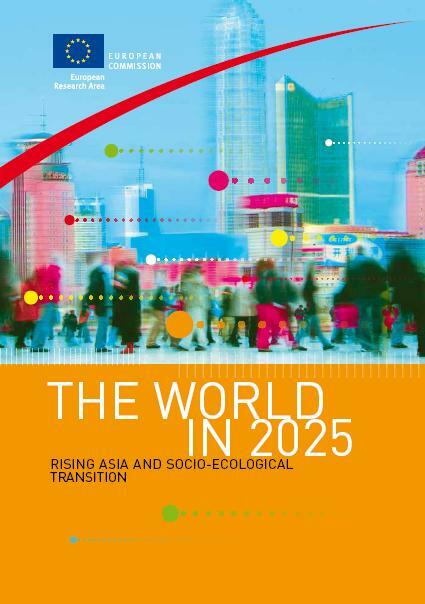 “Rising Asia and socio-ecological transition” is the explicit sub-title that could be an inspiring source for the future strategy of the European Union.